A shakedown as old as government. The criminal complaint targeting Chicago Ald. Ed Burke reads like a cliched crime novel: Influential alderman squeezes restaurant executives to benefit his law business, delicately at first, over lunch at a private wood-paneled country club. Federal agents locate the alderman via a black Crown Victoria, his riding-around car, in the parking lot. The alderman is known for his silver coiffure, pinstriped suits and pocket squares. His three-story brick home on the Southwest Side is landlocked by railroad tracks and industry, strip malls and bungalows — but protected by a tall wrought-iron fence with a locked gate. He is untouchable. Until now. Burke, of Chicago’s 14th Ward, faces one count of attempted extortion. The U.S. Department of Justice accuses him of holding up city permits and slow-walking a restaurant renovation in his ward until the company agreed to hire Burke’s law firm, Klafter & Burke, for property tax work. The Corruption Party has had one party rule in Chicago for decades. Nothing is changing. No one represents Chicago’s old-school machine politics — or what’s left of it — more than City Hall’s longest-serving and most powerful alderman, Ed Burke. I’m pretty sure I saw this on Blue Bloods. The Chicago police department’s monthly crime summary released today features a headline that may change the gun violence narrative that’s focused so much attention on this city. For the eighth month in a row, gun violence has declined here. October saw a 30-percent drop in murders compared to the same month last year and a 34 percent reduction in shootings, according to the report. For the year so far, there have been 57 fewer murders than in 2016, a decline of almost 10 percent. The drop in shootings is even more dramatic: 545 less than in 2016, a reduction of over 18 percent. Police attribute the progress mainly to enhanced technology and more focused intelligence gathering on the gangs that have generated most of the gun violence. Anthony Riccio, chief of the Chicago police Organized Crime Bureau, tells ABC News that “strategic support centers” set up in some of the city’s most violent districts have played a major role. These centers combine computerized information about people in those areas likely to commit crimes — data such as police records and incident reports — with intelligence gathered by officers on the street. The result is what the CPD calls “predictive policing” that tells the cops where and when to deploy officers, preventing gun violence before it occurs. Ouch. The tragic consequences of bad public policy combined with a toxic culture. Chicago, effectively the capital of America’s Midwest, is hurtling toward the end of its deadliest year in nearly two decades, with more than 750 murders and 3,500 shootings. 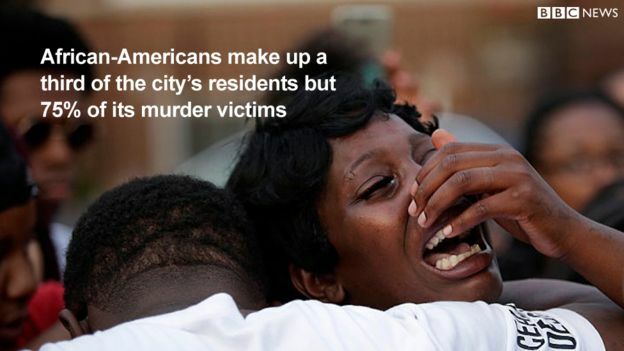 By comparison, America’s two biggest cities, Los Angeles and New York, had about 600 murders combined. The shootings in Chicago, which spiked nearly 50 percent in 2016, were concentrated mostly in historically segregated, economically struggling and predominantly African-American and Latino neighborhoods. The department is facing a federal civil rights probe, the outcome of which could change how officers operate, adding a measure of uncertainty in the new year. The force already has difficulties dealing with a wary African-American population. Some do not cooperate in murder investigations out of fear of retribution or distrust of police. The department solved only about a third of the murders committed in 2016. Be sure to fill up before entering Chicago. CHICAGO (WLS) –The Chicago City Council is set to take up a proposal about E15 gasoline. The council’s finance committee passed the ordinance Monday. Supporters say the 15 percent ethanol and 85 percent gasoline blend reduces smog and helps the environment. But not everyone agrees that city gas stations should be forced to sell the fuel. If the full city council passes the ordinance, Chicago will be the first city in the country to require the sale of E15 at all gas stations.